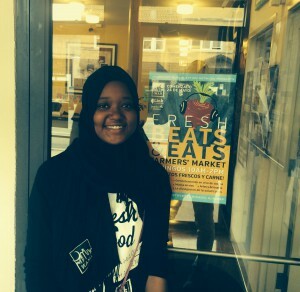 Aminah Ali, an IMAN Board Member and longtime youth leader, was recently awarded the Sargent Shriver Youth Warriors Against Poverty Leadership Award by the Marguerite Casey Foundation. Just back from the presentation banquet in Seattle, Aminah sat down to reflect on the honor and her development as a key part of IMAN. So, how was your experience at the awards ceremony? AA: I’d say it was both inspiring and humbling. I enjoyed meeting the Marguerite Casey board members and hearing their stories and about their philanthropy. It was amazing to learn that some of them had grown up poor, but after becoming financially successful they were able to give back in such amazing ways. What was it like meeting the other award winners? AA: We all stayed in the same hotel, ate together, stuff like that. It was inspiring to see my peers who put in such amazing work and are now getting recognized for it. The work that I was honored for – food justice – was unique among all the other awardees, so that made it even more special. Learning about the challenges that my peers have overcome to get to this point was extremely humbling. A lot of them come from much more difficult circumstances than I do, struggles with immigration policy and other things. It just gave me some perspective. How did you first get involved with IMAN? AA: Well I was about 13 or 14 years old. My stepdad handled the security there and then Shamar, the Organizing Director, also got me involved. I started out just helping with a couple programs, but I soon realized that I wanted a long-term connection to IMAN. Have you benefitted from your time at IMAN? AA: Absolutely. My mentors at IMAN helped me to come out of my shell, to better understand the world around me and take a leadership role in it. The biggest change I’ve seen in myself is my comfort with public speaking. When I was younger, I’d never talk in front of people. I wouldn’t even raise my hand in school. Now I feel more comfortable voicing my opinion. IMAN also opened my eyes to different ethnic communities in the city: Arabs, Latinos, Asians and other peoples. Experiencing this diversity changed how I deal with other people. I was already pretty accepting, but working with IMAN helped me become even more open-minded. What can we expect next from Aminah Ali? AA: In the next couple of years, I want to work as a dental assistant and earn an Associate’s degree in Science. Then, I’ll transfer to a university and get a Bachelor’s degree. Eventually, I want to become a dentist. I plan to continue serving on the IMAN Board of Directors, and to stay connected to the organization through internships and my relationships with staff. What would you tell other young people who are interested in community work? AA: I’d tell youth to not be selfish, because we do that as teens sometimes. Realize the bigger picture: helping community and family allows you to realize the purpose in your own life. Plus it will benefit those who come after you. This entry was posted in News, One Nation, Organizing & Advocacy, Uncategorized, Youth Services by IMAN Staff. Bookmark the permalink.